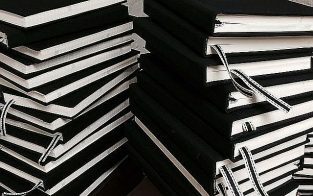 Design Bindery consults on and produces specially commissioned Custom Projects such as uniquely designed journals, planners, sketchbooks, notebooks, boxes, slipcases, photo albums, coasters, and game boards to name a few. We got our start a few years ago, answering the call for special products no one else wanted to produce from diverse companies such as wineries, paper companies, sports teams and oil companies. It’s just grown from there as no two projects are the same. Small quantity production on up to larger scale rollouts are possible. We currently produce ongoing work for clients in the areas of photobooks, sketchbooks, book publishing, paper companies, Architecture, and branding/design firms. If you have a project idea, email info@designbindery.com to get started.